Does 'Matter' matter to you? Are you in grade 2 or grade 3? 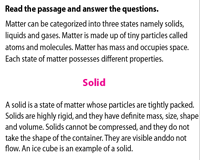 Then this collection of state of matter worksheets is ideal for you. This stack includes visually appealing charts with definitions and properties of the three states of matter. Tackling one at a time, work your way through amazing activity formats like cut and glue activities, picture and word sorting, fill up and many more to build knowledge and test comprehension. 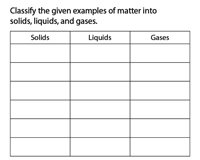 Aligned with the topic properties of the three states of matter, the chart here stimulates interest, summarizes the properties of solids, liquids and gases and assists in distinguishing between them. Direct the children of grade 2 and grade 3 to observe the illustrations given in this circle the solids worksheet. Apply the properties to help figure out and circle the solids. 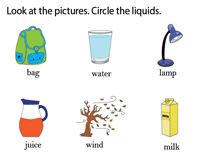 Examine the pictures and analyze their properties to decide which of the objects are liquids. 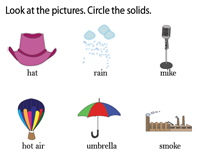 Hunt for the objects that possess the characteristics of liquids and circle them in this identify the liquids worksheet. Study the pictures carefully and contemplate on which of them contain or emit gas. 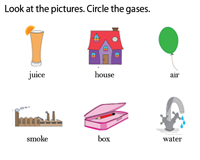 Track down the objects associated with gas and circle them in this circle the gases worksheet PDF for grade 2 and grade 3 kids. 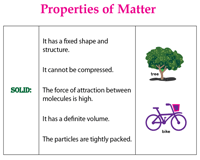 Equip yourself with this activity to learn classification of matter. Read the words in the word bank, identify their state and write them in the appropriate columns in this sort matter as solid, liquid or gas worksheet. 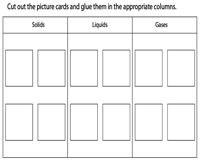 An interesting variant to the sorting activity is this classifying matter cut and paste activity worksheet. Snip the picture boxes, sort them as solids, liquids or gases and glue them in the correct columns. 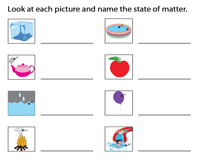 Observe the objects in the pictures cautiously and recognize the category of matter they fall into and label the objects as solids, liquids or gases in this identifying the states of matter worksheet. Read the list of words, ponder awhile, identify the state as solid, liquid or gas and name them accordingly. 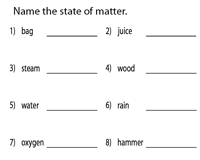 Recapitulate the concept with this recognize and write the states of matter worksheet PDF. 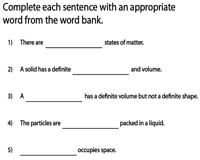 This meticulously designed states of matter fill in the blanks worksheet consists of sentences to be completed by using the appropriate words from the word bank. Serves best in testing comprehension. Read the passage, process the information given in the context and answer the questions. Utilize this study tool to elicit responses from the children of grade 3 based on their level of comprehension.